Decrease in number of hostile attacks was recorded in all sectors of the ATO zone. The total of 24 attacks at Ukrainian positions took place. Militants are using Minsk proscribed mortars of various calibers, firing the total of 76 rounds. Ukrainian troops responded with fire. 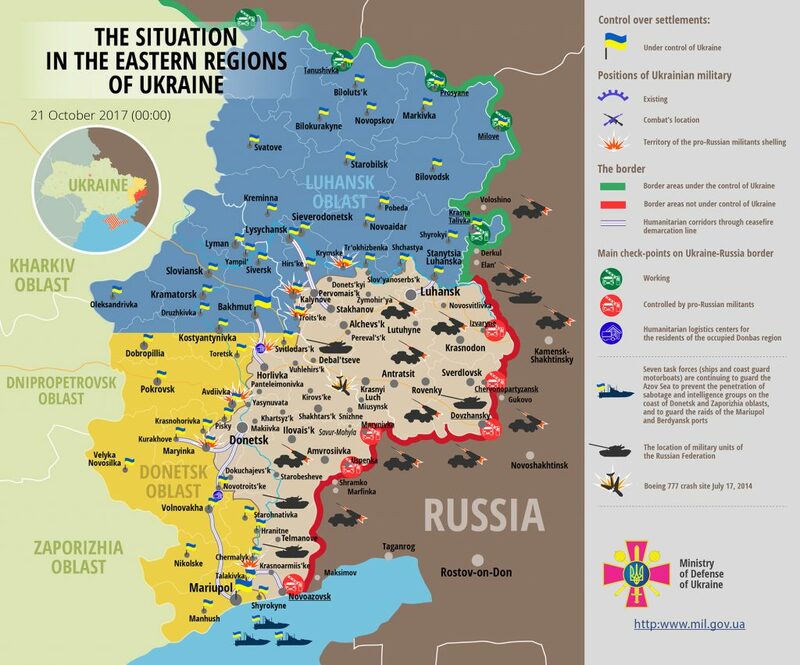 No Ukrainian serviceman was killed or wounded in action, informed Ukrainian Ministry of Defense spokesman on ATO- related issues Colonel Andriy Lysenko at a press briefing at Ukraine Crisis Media Center. The largest number of aimed attacks with various mortars were recorded in Luhansk sector. “Russian proxies opened aimed fire at ATO troops’ positions near Novooleksandrivka and Katerynivka, firing the total of four 120-mm mortars,” said Col. Lysenko. Militants were shelling Ukrainian troops’ positions near Novooleksandrivka and Troitske with 82-mm mortars. “Russia-backed militants conducted six aimed attacks from IFV weapons, small arms and mounted grenade launcher in the above-mentioned inhabited localities as well as in the vicinity of Novozvanivka, Krymske and Popasna,” added Col. Lysenko. In Donetsk sector militants fired at Ukrainian positions ten times. “They used grenade launchers and small arms three times near Avdiivka and Zaitseve, as well as in the vicinity of Kamianka, Verkhniotoretske, Shakhta Butovka and Troitske,” said the spokesman. The attacks at Ukrainian positions were quite lengthy near Avdiivka. ” The enemy conducted aimed fire from 120-mm mortars from 16:00 to 23:00, firing the total of 12 rounds. They also used IFV weapons, mounted grenade launchers and small arms,” explained Col. Lysenko. In Mariupol sector Russia-backed militants conducted eight aimed attacks at Ukrainian positions with grenade launchers and machine guns. “Militants attacked three times in the vicinity of Pavlopil, twice near Hnutove as well as in the vicinity of Vodiane, Maryinka and Novotroitske. The enemy fired two 120-mm and five 82-mm mortar rounds at Ukrainian fighters near Pavlopil,” said Col. Lysenko. Report on the military developments as of October 20 is available here. Interactive data on the shelling: chronology shelling chart and the interactive map.